This season Aidan O'Brien has established a new record of - at time of writing - winning 26 Grade 1 events. What makes this astonishing - is that the record breaker hasn't just bought stakes in hopeful or established horses. He's achieved this on the back of his own hard-won determination to revamp the entire business of how to manage thoroughbred stables. There's no sudden success or fluke to his story. Instead, it is the well-earned consequence of a near unique mindset on how to train and manage his stables. Sometimes this has run contrary to fashion - but on current form, and as much as minimum deposit casinos are fun - why not take a look at the most classic gambling going? We'll guarantee the bookies are doing so! The advantage is that O'Brien seems to have a genuine gift. Anyone bar the newest horseracing enthusiasts will have a good idea of O'Brien's background. For those in the dark, he's pretty much the antithesis of what anyone would think of a tough bred Irish trainer would be. First of all, he's renowned for looking out for his staff. This attitude likely comes from when he was a kid turning out the stables when his dad back in the 1908s. His mild - and discreet manner - when taking in occasional speeches and thanking various awards/interviews always specify this fact. To put it simply, he's apparently a great boss and one who looks to develop talent much like those stabled in his care. Interestingly - and again largely contrary to most trainers from the Emerald Isle - he's been teetotal since the teenage years. It's not something he discusses in detail but has been a part of his life since teenage years. He's a member of the Pioneer Total Abstinence Association. Hardly one of the best-known rehab or community organization on the planet, but as far as we know he's never been a 'patient' himself. Known for mixing well with drinkers and smokers, he's also famed for rarely using more than four or five words in any rare interview. Literally the master in sporting diplomacy! O'Brien has seen some interesting turns over the course of his career. It certainly hasn't always been fair sailing. The early 2000's saw some (with hindsight) heavy-handed poor additions and over placing trust in horses that simply weren't good for the grade. Not to say he wasn't doing well - the determination and character he displayed here were the basis of forming 'the machine'. Now some racing fans may think that the likes of using 'Machine' to describe racing is demeaning. After all - why train and race horses if you're not into the 'craic'? To his professional credit, O'Brien answered his early critics - many of whom were looking to chase their own column space in UK national papers. Given his following successes, it's unlikely many racing biographers and historians would say that the harsh early criticism didn't help to develop that thick skin! 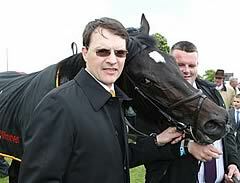 Ryan Moore has recorded 19 out of 26 victories for the Aiden O'Brien camp this season. Even for a jockey of such natural talent - and of course the horse to match - it is a remarkable record. By the looks of things the trainer may have (and despite working with many of the best) found the perfect sportsman to continue the legacy he's so proven to deliver. Assuming this partnership continues in current form. their rivals ought to be seriously looking at what to do next. Everyone knows there's no shortage of cash in racing, but O'Brien proves that sometimes the dark horse has a knack for bringing home the prizes. That he's clearly keen to encourage that on all his staff is something well worthy of additional applause.